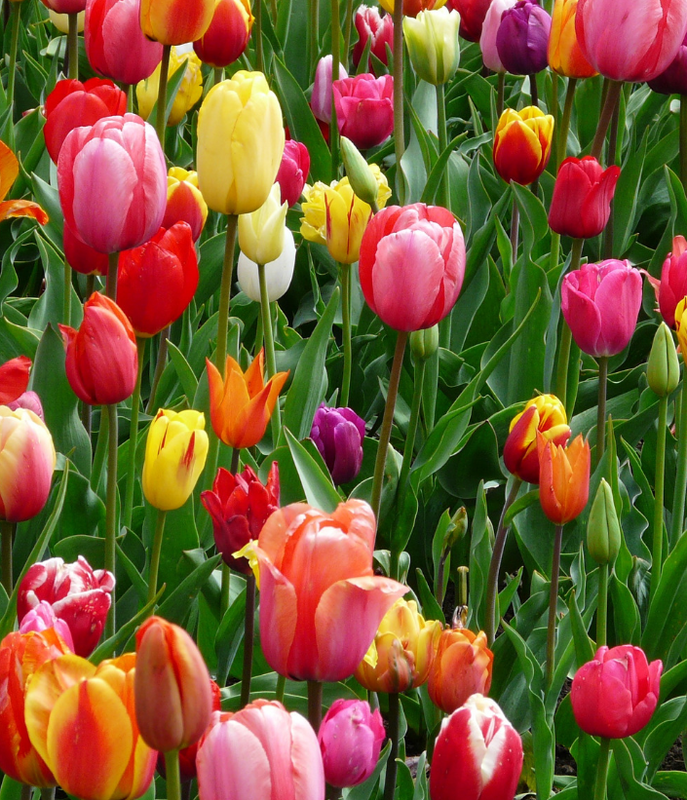 Whether your Daffodils are poking their beautiful noses up from their winter sleep, or if you still have several inches of snow on the ground, vernal equinox is a day filled with hope for warmer days and pleasant outdoor activities. In my area it means we can start planting hearty Spring veges like Radishes, Peas and Lettuce. For the Hub and Son it means ice fishing in the sunshine on the mountain lakes. Our weatherman reminded us that St. Patty's Day is time to move the Patty-O furniture outside. As a special treat, this year's equinox coincides with a full moon. That hasn't happened since 2000 and it won't happen again until 2030. Also, the full moon on March 20 will be a super moon, meaning it will appear slightly larger than your typical full moon. Now if that doesn't provide a good enough reason to stand an egg on it's end, I don't know what will. 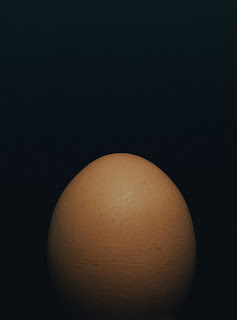 But I need to ask... Do you plan to stand an egg on it's end on vernal equinox? The recommended time to do it is at 5:58 pm. That's the exact astronomical moment that the Sun crosses the celestial equator. The lore says a raw egg should balance on it's end at that time. I'll be conducting my own egg-speriment. Cleaning house in the Spring started as more than just tradition. In my parents' generation is was a necessity. My mother's childhood home was heated with an oil furnace augmented with a wood stove in the upper rooms. My father's home was heated with coal. In the wintertime the soot and ash would build up on everything! As the days got longer and warmer, the house would be opened wide and every surface would be cleaned until it gleamed! The house I grew up in was heated using a propane furnace, unless the sun was shining through our large south-facing windows. The house was very solar efficient. In spite of the "clean" heat sources used in our home, my mother still insisted we wash down the walls every year. I never did understand why you'd wash an entire wall just to get rid of the fingerprints around the light switches. Jews clean as part of the Passover celebration. Catholics clean the church alter for Good Friday. The Greek Orthodox clean for a week in preparation for Lent. The Persian New Year includes 13 days of "shaking the house". Spring Cleaning the sewing room. Can you imagine what your sewing room would be like if you used coal heating? You would need 13 days of "shaking the fabric" to get that in order! Yuck! But it might keep us from Hoarding fabric, as some of us do. Many of you know me well enough by now to know I'm not going to dive headlong into a major cleaning project. (ie: the entire sewing room.) and power through until it's done. Some of you are surprised to hear I'm diving into a cleaning project at all. Don't tell the hub, don't get his hopes up. Good news, I'm only talking fabric scraps today. As with any cleaning/sorting project at any time of year, NEVER pull out more than you can put back together in 1 hour. That way if you need to leave the project before you finish, you'll be less than an hour behind when you get back to it. Once the hour is gone, or the project finished (it may take a few tries to figure out how much you can do in 1 hour), you have the option to continue the project with an additional 1 hour allotment, or start something else entirely without leaving a mess. This way you never have to feel guilty for emptying the coat closet into the front room, knowing it will take 4 hours to sort and store, while also knowing the chance of getting 4 hours together is next to 0%. That kind of project can take over your front room for weeks. After a while, you'll get used to the coats and gloves being there. You'll forget it was supposed to be a cleaning project and the coats will become a semi-permanent fixture. You'll begin using the front room as your new coat closet, and wonder why you thought the closet was too small before. Or does that just happen to me? ... I bet not. If you don't like scrappy projects and never intend to use scraps in your sewing projects, make a box of all fabrics of any size that you know you won't use. Donate the whole box to your guild or to another quilter who will appreciate them. 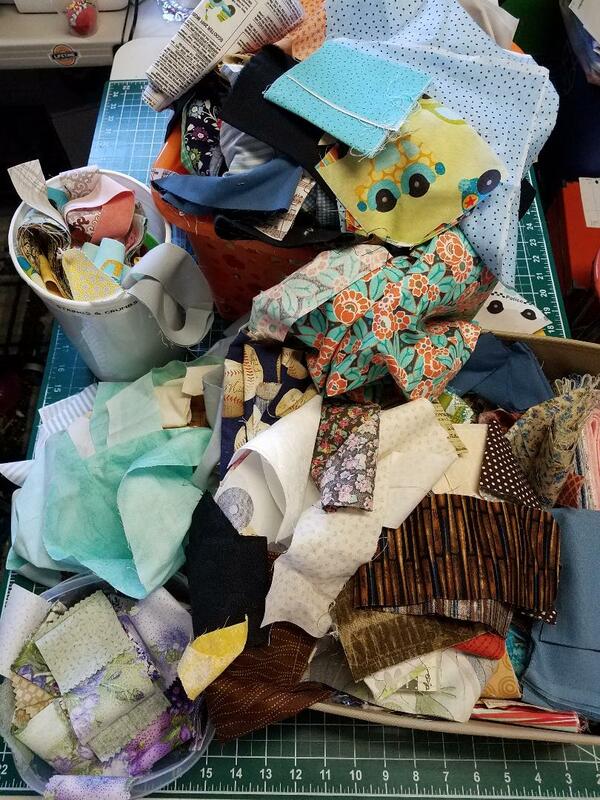 When I began quilting I looked forward to having a cute laundry basket in my sewing room filled with a pile of beautiful scraps. So I got a basket at the dollar store and began filling it. It was a bad plan. It has resulted in an overgrown mess. And don't be deceived, this isn't all of it. This is just what I thought I could put back in an hour. You wouldn't bring home a new puppy without first preparing a place for him to call his own. Same goes with a project like this: Your scrap sorting system needs a dedicated home. It should be easily accessible, simple to use and customized to you. Furthermore...The system should be in working order before you begin using it. You can tweak it as you go along. But you should know where you are heading. How many locations do you have scraps in now? What kinds/sizes of scraps do you keep? What size scrap is too small to save? What do you intend to make from your scraps? The first 3 questions are just a reality check. Where are you starting? The last 2 questions will determine the job you want your system to perform. Those 2 questions are the most important of the entire scrap wrangling exercise! Saving 5” squares will not be helpful if you want to make a strip quilt. What do I intend to make from my scraps? Skinny strips under 2 1/2” and over 1 ½", all lengths up to 10”. I also know now what scraps are too small to save. 1 1/2" x 2" rectangles are too small for me to put in a sewing project, but they make perfect leaders and enders, thread chargers, thread spiders or whatever you call that bit of fabric you send through the machine to keep your fabric from being driven into the bobbin case. DO NOT gather all your scraps into one giant pile and jump in. This will take you more than 1 hour. Make a pile that you think you can subdue in 1 hour. Start with a pile about the size of a gallon of milk. Time yourself. Was that pile an hour's worth of trimming? Or did you finish it in 15 minutes? Adjust the size of your pile until you know about how much trimming you can finish in 1 hour. You may need to press scraps before cutting. If you can get yardage or fat quarters from a scrap, do that first. Cut everything you can from one chunk of fabric before moving on to the next. Cut in order of your priorities. When you can no longer get cuts from the fabric, it's ok to throw the rest away. If you do applique, consider keeping green triangles as they are to use as leaves. Now my system works for me. 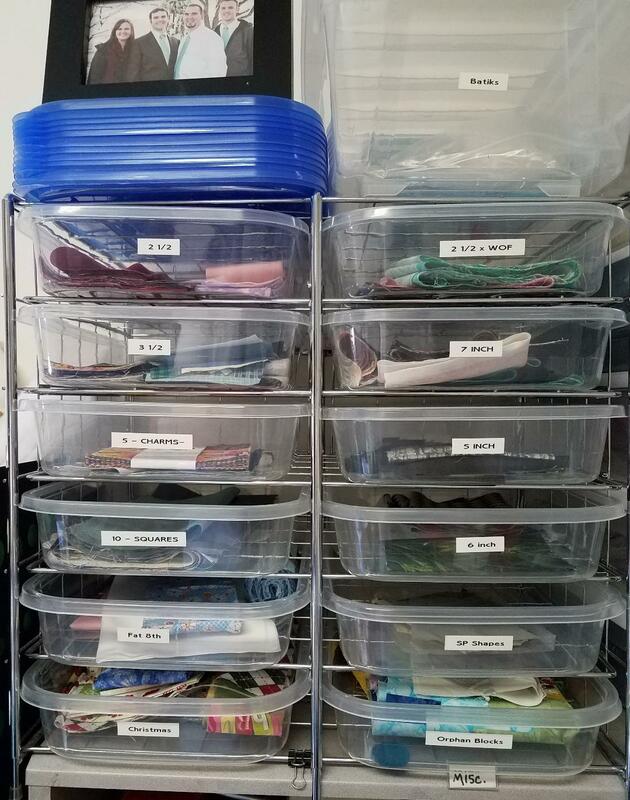 Armed with the knowledge above, and knowing what my other needs are, I know my system requires the following bins: 5” squares, 2 1/2” strips, Skinny strips. Extra bins can be customized to my liking. I have 12 bins, sorted to the following sizes. Yours will be different to suit your needs. I also keep often used size pieces: 3 1/2” squares and strips, 7” squares and strips, 10” squares, 6” squares and strips. I have bins for Fat Eights, Seamless Piecing project leftovers, Christmas fabric scraps of all sizes and Orphan Blocks that will eventually become a eclectic quilt. Skinny Strips and 2” squares Have their own bins beside the cutting table. 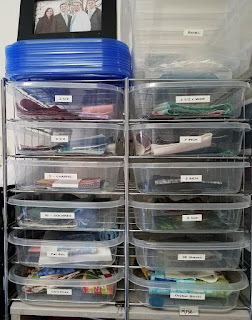 As each of my bins fills, I'll work the contents into it's respective quilt, or move the contents to another holding bin until I have all I need for my intended project. Remember this is YOUR tool. Make it work for YOU. DO NOT turn on Netflix and zone out while you are trimming. I can't tell you how many times I've come to the end of my 2 hour movie with my 1 hour pile still in front of me. Radio is better. Sing along to keep the party rolling. If you don't learn anything else today, remember to make your scrap bins work for you. I'd love to hear about your scrap wrangling systems. Share your successes in the comments below. You can follow SeamlessPiecing.com on Facebook or Pinterest. Best wishes getting your scrap together! P.S. If you've never read Stephen Covey's book “7 Habits of Highly Effective People” I recommend it regardless of your profession or situation in life.